Two hundred years ago, in the shadow of a mammoth Naval victory, the United Kingdom was a nation in mourning. The man who arguably put the "great" into Great Britain was dead, killed by a French sniper's bullet at the Battle of Trafalgar. And so on Friday, in a peculiarly English tribute, Admiral Lord Horatio Nelson was remembered and his achievements celebrated as part of the year-long Trafalgar anniversary celebrations. 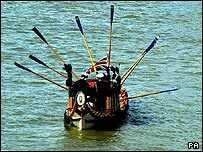 A flotilla of 70 boats, complete with Royal Navy VIPs, actors in 18th century dress and descendants of the man himself, rowed a choppy Thames in a re-enactment of Nelson's last journey. In January 1806, Nelson's body was taken from a three-day lying-in-state in the Painted Hall in Greenwich to his final resting place in St Paul's Cathedral. Tens of thousands lined the banks of the Thames to pay respects to a "flawed but great" hero. 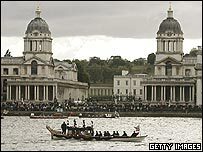 Two centuries later, more than 1,000 people took their place along the London river to watch the spectacle as head of the Royal Navy, First Sea Lord, Admiral Sir Alan West took the New Trafalgar Dispatch from the same Painted Hall along the Thames in The Jubilant, a wooden funeral barge. 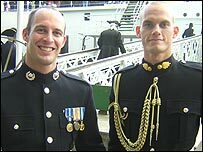 "It might not be quite so good as 1806, but it is certainly a great turnout," said Royal Marine commando Craig Nelson, a sixth-generation descendant of the Vice-Admiral. From the cheering crowds, to the plethora of dignitaries turned out for the occasion, it is clear his illustrious ancestor still has influence - but perhaps most evidently in his own family. 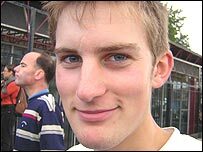 He has two brothers - L/Cpl Brett (Army) and Cpl Arron Nelson (RAF). "Being in the military we can see how hard it must have been to achieve what he did," said L/Cpl Brett Nelson. "He went to sea at 12, and at 20 became a captain." "Everyone looks at his tactics and uses what he did to this day," said Cdr Craig Nelson. Indeed, while they justifiably grew up proud of their forbear, such is his legacy that until now they have kept their links to the great man quiet, fearful his enduring reputation would overshadow their own military careers. Among the crowd cheering on the re-enactment was Chris Hutchins, 41, from Esher, Surrey. "It's been a fantastic occasion," she said. "It's made me feel very proud and it is a fitting tribute to a very great and fascinating man." Another, 18-year-old Hugo Hadlow, was drawn to the water's edge in Greenwich by the spectacle of the ships. Remembering the past was important, he said. "History is interesting and stops us making the same mistakes," he said. So after all this time why is Nelson still a draw? He was this amazing combination of human strength and human frailty. "Trafalgar was a defining moment in Britain's history as it established Britain's maritime ascendancy for 100 years which saw a fantastic growth of trade and empire during Victorian times," said David Quarmby, chairman of SeaBritain 2005, which has organised the 200th anniversary Battle of Trafalgar celebrations. "Nelson is a great part of English folklore history, perhaps the best known of Britain's military heroes." But it is not just the man who fashioned an island nation into a naval superpower, it is also the man involved in the scandalous love affair with Emma, Lady Hamilton, which continues to capture our imagination. "He was this amazing combination of human strength and human frailty. He was one of British history's really interesting characters."